Brother-in-Law Don Riley wanted to catch the Cardinal – Marlins Spring Training opening game at Roger Dean Stadium in Jupiter, FL., today. I think the last baseball game I attended was the year the Marlins won their first World Series. After all the players were sold off, I lost interest in the team. We had great seats – three rows back behind home plate. There was a smattering of kids and younger folks, but it was mostly a geezer crowd. 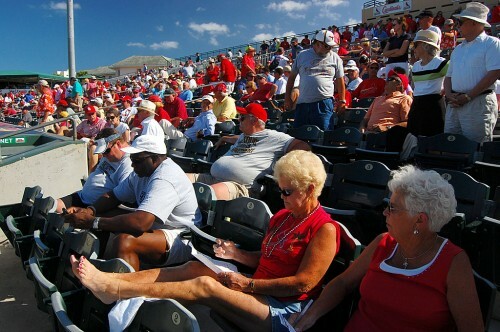 Most of the crowd, in fact, was closer in age to Hall of Famer Red Schoendiest than Albert Pujols, who was warming up in the first picture.. Everybody cheered when the announcer said the temperature in St. Louis was 36 degrees and the temperature in Jupiter (the town not the planet) was in the low 80s. These two St. Louis fans were serious. They probably did a better job scoring the game than the official scorekeeper. They kept up a running commentary the whole time there were there. 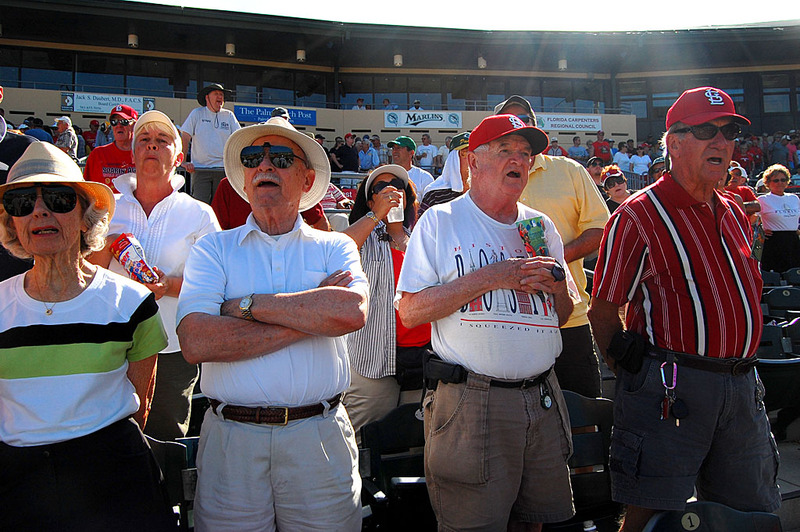 The fans offered up a rousing rendition of Take Me Out to the Ballgame during the seventh inning stretch. The woman who sang the Star Spangled Banner had a pleasant voice, but Don and I thought she had a word wrong and left out a line of the song. It was close enough, though, that she got applauded when she was done. She did a better job that I could have done. Red was the color of the day, but there were a few vocal Marlins fans in the crowd. The Cards were behind from the very first inning in their 6-3 loss to the Marlins, but it was still a great day at the ball park. The temperatures were a bit warm, but there was a gentle breeze that kept things from getting uncomfortable. 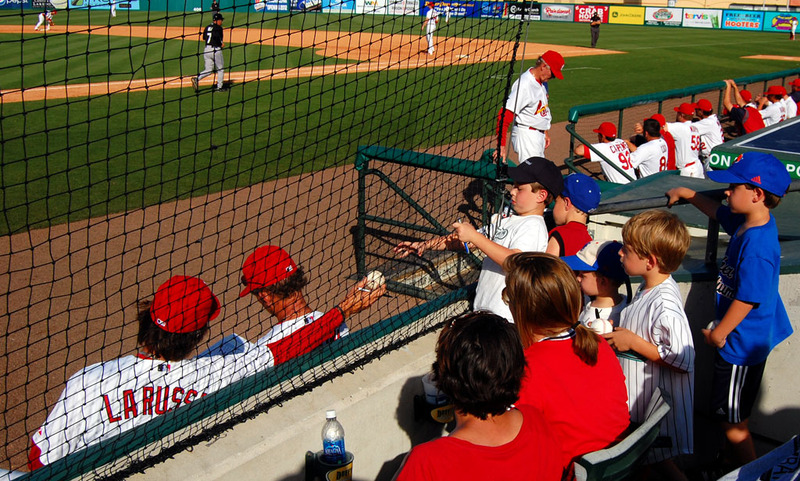 One of the things I liked best was watching Coach Tony La Russa sign baseballs for a bunch of kids between innings. Ken, thanks for sharing. 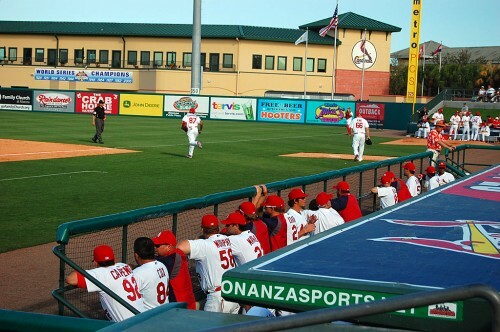 Some day I hope to get to Jupiter to watch the Cardinals. I have season tickets and go to the Winter warm-up each year but have never been to the Cardinals spring training. In a little over a week, my recently retired friend and fellow collector is going to meet me in Arizona for a week of spring training baseball. We hope to see about 9 games in a week, including a couple games of his beloved Cubs. I will be easy to spot in the crowd as I will be wearing one of my Cardinals hats! No matter what team you root for, EVERYONE would enjoy Dorris Kearns Goodwin’s “Wait Til Next Year”. It is the story of her life long devotion to the Boston Red Sox and a beautifully written testimony to the religion of baseball! Hmmm. I looked in your photos for a couple of older people from Battle Creek, but no luck. He was an elementary school classroom teacher and drivers ed instructor for my boys. They tend to be big fans of the Cardinals because their son is Director of Media Relations — and has been with the club for many years now. 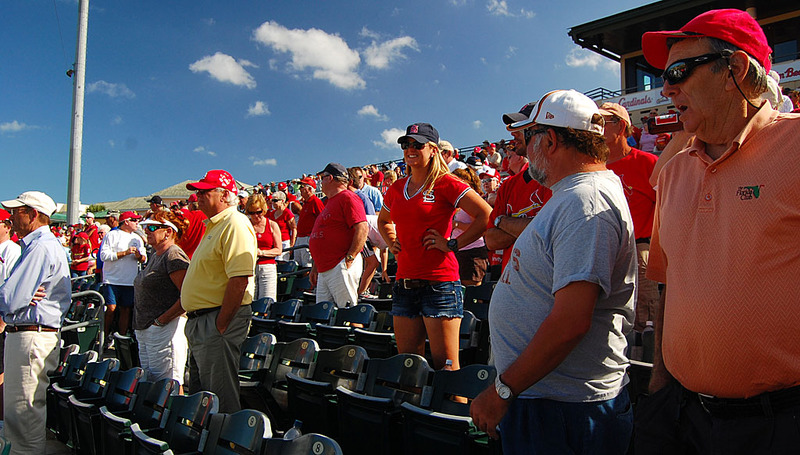 When we’d go to local minor league games they’d always be there, several rows behind home plate, in full Cardinals regalia. If the Peoria team was in town (back when it was a Cardinals farm club) they wouldn’t root for the home team. Maybe you had their seats. I’ve never met their son, but I’ve learned how to spot them in a baseball crowd pretty quickly. Well, actually I do see one guy who might be him, but he has his head turned and his wife isn’t with him. While trying to find my friends in your photos, I noticed one sunny young woman who looks a little young for that crowd. It seems she is with someone, but it reminds me that in addition to watching Tony LaRussa sign baseballs, you should also try to figure out which ballplayer girlfriends have their heads in the game. It does sometimes happen. Funny you should mention that. The two gals in red in the front row where the boys are lined up were a source of fascination. They were there at the start of the game, but were run out by the ushers. They were back somewhere around the 6th inning, had a few words with the usher, and stayed until the end. They didn’t seem to have any connection to any particular player, but body language seemed to indicate that their interests might have been different than the two ladies I photographed scoring the game. I had more fun watching the crowd and trying to decipher the dynamics than keeping my eye on the field. Another thing Don and I commented on was how relaxed everyone was. I saw more casual conversation between opposing players and officials than doing a normal game. I guess the opener is like the first day back at school in the fall where you catch up on what everybody did while they were on break. Thanks for sharing one of the great days in mankind. Opening day in spring training is one of top days for hope and renewal. Everyone has a chance to win the BIG one. Hope springs for everyone, we could win the whole thing and on an individual focus maybe, just maybe I could make the team and make the big leagues. Nice day, thanks for sharing! How did you get such good seats? 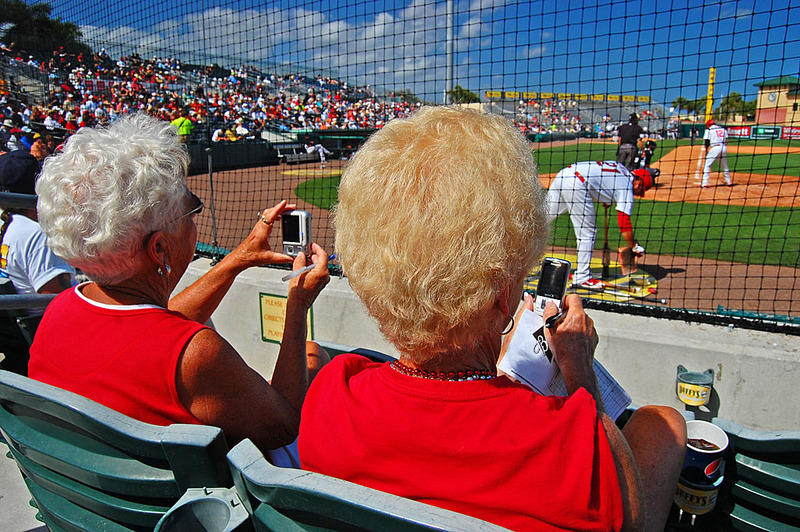 I got on line a few weeks ago for some spring training seats and they were all at the end of right or left field. We decided to wait until next year and start planning earlier. 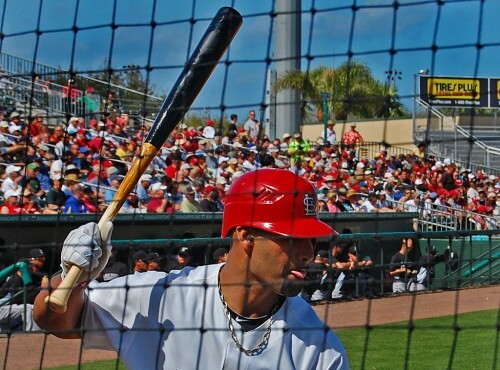 Have been to one spring training game and they are awesome. As you said everyone is so relaxed and friendly to the crowd. And I guess I will just have to be an old geezer!! Today’s obituary of Duke Snyder brought back memories of the mid-50s and how Cardinals baseball was rabidly followed by ten year old boys such as myself. In the days of just eight pro teams per league, perhaps no other team had such a huge geographical fan base. Nor, perhaps, an announcing crew which could surpass Harry Carey, Jack Buck and Joe Garagiola. Among my treasured memories was the contest among kids to collect the most cash register receipts at Walker Childs’ IGA on Broadway. The top 25 winners (I was one) got to have dinner with Kenny Boyer and ‘Vinegar Bend’ Mizell at the Colonial Tavern.